Partly cloudy skies. High 28C. Winds SE at 5 to 10 mph. Mostly cloudy skies. High 28C. Winds SSE at 5 to 10 mph. Partly cloudy. High 29C. Winds SSE at 5 to 10 mph. Partly cloudy. High 28C. Winds SE at 5 to 10 mph. Thunderstorms in the morning, then partly cloudy late. High 27C. Winds SE at 5 to 10 mph. Chance of rain 80%. Scattered thunderstorms. High 28C. Winds SSE at 10 to 15 mph. Chance of rain 50%. Halong Bay is one of the most popular tourist attractions in Vietnam with world recognition. Halong Bay belongs to Quang Ninh Province, a Northeast province of Vietnam, making its weather shaped by northern typical climate. Halong has two distinct seasons – hot and moist summer and dry and cold winter. Cold winds often start from November to March, meanwhile, the hotter days often fall between June and September. The rest of the years are transitional months that see the mix of these two patterns. Although you can travel to Halong Bay all year round, there are some better days to visit the Bay than the other. Normally, the best time to visit the Bay is from March to May and from October to December. However, the weather has now seen changes which make the parameter of what is called “the best time” no longer 100% accurate. That being said, any day can be a good day in Halong Bay. Winter extends from November to February but March witnesses subtle changes for humid spring to come. It is considered the best time to visit Halong Bay. February is a unique time of the year for visitors to witness Halong Bay in a more remarkable way. January is among ideal times to explore Halong Bay – a mighty and unique natural masterpiece. 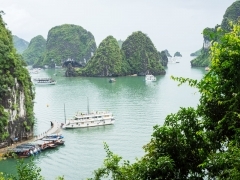 The most common departure cities are Hanoi and Hai Phong, both of which have her own international airports and a complex of highway that connects to Halong Bay.